The Analytic Trading News Indicator for MetaTrader overlays up-coming and recent news events relevant to the instrument chart it is added to, with the optional display of all USD news events. 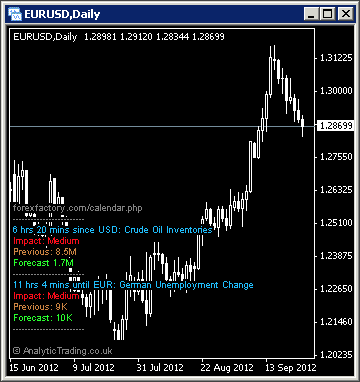 It will display screen alerts and send email alerts at specified times before events, and shows the typical impact of the event, previous and forecast figures – all taken from the data feed provided at forexfactory.com/calendar.php. Credit for the original version of this indicator goes to DerkWehler and his excellent thread on Forex Factory where you can download his version for free. Our version is simply contains our added display and pip calculation functionality to work better for our needs. Although we are technical traders, it is the news events that create the volatility we are looking for to find the best trade setups. It is also important to monitor news events when there is an open trade on the relevant instrument. By default, we have the news indicator displayed on our S&P 500 chart in the top-left window of all forex, commodity and index profile layouts, to monitor market risk-sentiment and events likely to cause significant price movements. Then, when we have a trade open on an instrument, we will make sure we have one chart with the news indicator displayed so that we can monitor the price-action that evolves around risk events, to help manage our trades. IncludeHigh true/false true The switch to show High volatility news events on the current forex instrument chart. IncludeMedium true/false true The switch to show Medium volatility news events on the current forex instrument chart. IncludeLow true/false false The switch to show Low volatility news events on the current forex instrument chart. IncludeSpeaks true/false true The switch to show events where notable market influencers speak. IsEA_Call false/true false The News indicator has the ability to trigger EA trades for developers. OffsetHours 0 -12 to 12 The GMT/BST Offset for your local timezone. AllowWebUpdates true/false true Set this to false when another indicator instance is already running on that same symbol and same period. Alert1MinsBefore -1 integer The number of minutes before an event to show the first screen alert. Alert2MinsBefore -1 integer The number of minutes before an event to show the second screen alert. Email1MinsBefore -1 integer The number of minutes before an event to send the first email alert. Email2MinsBefore -1 integer The number of minutes before an event to send the second email alert. ReportAllForUSD true true/false The switch to show all USD news events regardless of the instrument chart used. EnableLogging false true/false Debugging logs. ShowNextTwoEvents true true/false The switch to show the on-chart text information for the latest 2 relevant events. ShowVertNews false true/false The switch to show lines on the actual chart bars for news events. TxtSizeTitle 7 integer The title text size. TxtSize 7 integer The details text size. TxtColorTitle Gray any colour name or RGB value The indicator title text colour. TxtColorNews DeepSkyBlue any colour name or RGB value The news event name colour. TxtColorImpact Red any colour name or RGB value The impact text colour. TxtColorPrevious Peru any colour name or RGB value The previous text colour. TxtColorForecast Lime any colour name or RGB value The forecast text colour. VertLeftLineShift 900 integers How far away to the left of the line we want to place our vertical news text. VertRightLineShift 200 integers How far away to the left of the line we want to place our vertical news text. VertLineColor SlateBlue any colour name or RGB value The bar lines colour. VertTxtColor DimGray any colour name or RGB value The bar lines text colour. VertTxtSize 7 integers The vertical text size. NewsXPos 3 integers The distance from the chosen corner. SaveXmlFiles true true/false The ability to generate daily Xml files of news events. These can be used with EAs capable of using them for filtering news events in backtesting.